This lunch may not look pretty but some of it was delicious. For this meal I tried something new for me, I made savory food with rhubarb. This is a continuation of my series of featured ingredient lunches. I have many more planned for the upcoming months. Hopefully they will be more attractive than this one. I grew up with rhubarb in my family garden. It was also in my Grandparents garden. In the spring we often had rhubarb and strawberry desserts. When I married my husband and I moved to a rural area, my mother-in-law was surprised that I had experience with rhubarb. Maybe it is an unusual ingredient for people to use. I never had to buy it from a grocery store but I occasionally see it there. I usually have a stash in my freezer. I wash it, cut into about 1 inch pieces and freeze in freezer bags. Please tell me in the comments if you have ever tried rhubarb. 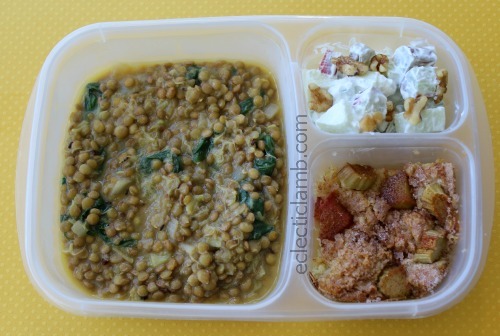 Left Side: Indian Spiced Lentils with Spinach and Rhubarb – I loved this recipe but I did make a few changes. I did not use the mustard seeds, used frozen ginger, and omitted the raisins and cilantro. I will definitely make this again! But I love Indian food. Top Right: Rhubarb Apple Salad – this was not my favorite recipe in this meal but it was sort of fun to eat rhubarb that was not in a dessert. If you do not like tart, this is not for you but if you enjoy sweet (apple) and tart (rhubarb) try this. Bottom Right: Sour Cream Rhubarb Coffee Cake – the batter was thicker than I expected but it worked out and my husband and 12 year old nephew loved this cake. This entry was posted in Bento / Cute Food, Food and tagged bento, featured ingredient. Bookmark the permalink. Reggie’s favorite pie is rhubarb custard. We have a great patch that was here when I bought the house. He separated it out and made an even bigger one and we share with many friends. We love just simple rhubarb sauce as well as other rhubarb desserts.